The fresh produce, meat and eggs will be great, but those aren’t the most important things the backers of Aberlin Springs hope to raise. The development, slated for 141 acres in Warren County’s Union Township, would be the first agri-community in the Tri-State. Its creators think it won’t be the last. 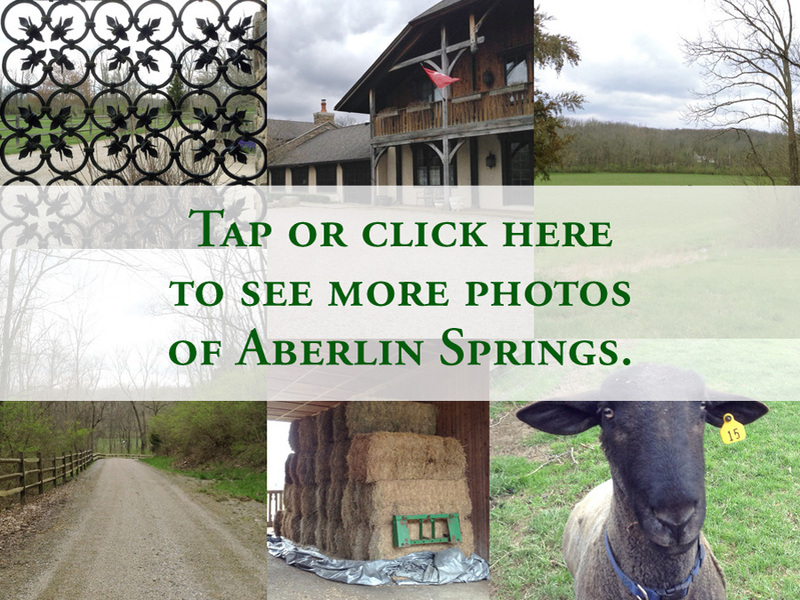 Aberlin Springs is to comprise about 140 home lots and a working farm of about 35 acres. It will transform the land that Leslie Ratliff’s parents bought in 1990 as their retreat and built into a combination estate and Swiss-style farmstead. Ratliff has a unique perspective on the planned development. Besides her personal connection — she lives in a smaller house behind the main house — she’s president of Pendragon Homes , a high-end, custom homebuilder whose work includes communities across Butler and Warren counties. Those are generally traditional developments with same-style houses lining both sides of residential streets. Like most U.S. developments since World War II, they’re designed around the automobile. Aberlin will be different. “This is about multi-generational connectivity,” she said, sitting in the spacious living room of her parents’ home. “People want community,” she said, and, as they live ever more at the mercy of their technology, they want to reconnect with the natural world. It’s the same trend that’s fueling the farm-to-table movement in restaurants, both from chefs’ and diners’ perspectives, but Ratliff said she wanted to widen that interest to encompass a complete lifestyle. The challenge was how to put those ideals into practice. While they’re not so well known in the Tri-State, combined agricultural-residential communities are actually not so rare in the United States. Among the most famous are Serenbe , near Atlanta, and Prairie Crossing , in Grayslake, Ill.
Making such communities commercially viable has proven far more difficult, though. “They have about an 80 percent failure rate,” Ratliff said. Her spark of inspiration came from her professional world of building homes —golf communities in particular. The flaw in planning most other agri-communities, she said, was thinking of the farm as an amenity, not a profit center. Many, in fact, were structured as separate nonprofits. Could a farm be profitable and survive? Sure it could, her research led her to conclude, but only with some financial safeguards built in. Enter the homeowner agreement . That’s the contract, known commonly as an HOA, that requires homeowners in a particular community to pay annual fees to cover the costs of maintaining their own property — like lawn care or snow removal — and of neighborhood common areas. At a golf community, that also can include the costs of maintaining the course. In those cases, residents get course privileges like discounted memberships in return. What if, Ratliff thought, HOA fees went toward community supported agriculture? Membership in a community-supported agriculture , or CSA, program entitles people to receive a certain amount of goods from a particular agricultural source, like a farm. Unlike shopping at a store, members take whatever food is ready to harvest. That’s when she met Marc and Claire Luff at a fundraiser. The young farming couple operate Finn Meadows Farm , one of the Tri-State’s best known commercial farms. The Luffs sell their organic vegetables, flowers and meat from pastured animals through a CSA (members pick up their food at the Indian Hill farm) and at farmers markets in Hyde Park and Montgomery . “We have 140 families in our CSA now,” said Marc Luff. They discovered they were kindred spirits, and plans soon took root. The Luffs will own and manage Aberlin Farm, the commercial farm at the heart of Aberlin Springs. The Luffs expect to raise about 50 different crops at Aberlin Farm, including many heirloom vegetables. They’ll also manage livestock, including cattle, chickens, sheep, pigs and rabbits. “What we can’t do a lot of is grass-fed beef,” Marc Luff said. Besides the obvious — higher yields — creating healthier soil fuels a cycle of additional benefits, he said. Earthworms and microbes create more organic matter that holds more water. That keeps nutrients bonded in suspension on-site, which reduces erosion. Chemical fertilizers will not be used. They do not actually improve soil, Luff said, and the nitrogen-rich runoff is a cause of toxic algal blooms in water, like the ones in Toledo in 2014 and last fall on the Ohio River . In addition, he said, fertilizers are petroleum products, which means their price is subject to the vagaries of the crude oil market. It’s already working at Finn Meadows. “We’re getting yields we’ve never imagined,” Luff said. Indeed, the majority of the 140 homes planned for Aberlin Springs (and nearly all the so-called manor and estate homes, which begin at $400,000) are to face either undeveloped woodland or farm land. Sixty so-called cottages, to be arrayed in two-row clusters of 10, are designed to maximize community interaction. The front doors of these pocket neighborhoods will open onto a shared green space (think park-like flower gardens); cars come and go through the back. All the homes will incorporate outdoor living spaces more integrated with the houses than just a porch. The cottages will be priced starting at $300,000. The first cottage is already earmarked for Ratliff’s mother, who said she’s tired of dealing with a big house. Her current home will become a community center. One of the barns will be converted into a store for the farm's goods. Ratliff had planned to build a first phase of just under two dozen homes to test the waters. Interest was so high, though, that she’s more than doubled the scope of the initial build. Like the Luffs, Ratliff believes Aberlin Springs can be the model for successful agri-communities across the Tri-State, and she’s convinced there’s a market for several more such developments. She’s even happy to share what she’s learned in the process with other would-be developers. “I want to show them how to do it,” she said.